I don’t know how I’ve missed this gem on previous visits to Greenwich, but I guess I have just headed straight to the Cutty Sark or to Greenwich park and haven’t veered into the shopping area. We stumbled across Greenwich market which is an undercover market, but is still a bit open to the elements. It has some great craft, jewellery, t-shirts, bags, paintings and photos, gift stalls etc and many food stalls with hot food and sweet treats – including some gluten free ones! 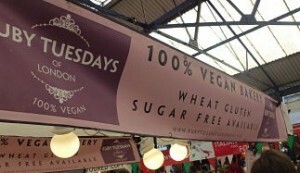 We were wandering through the market and found Ruby Tuesdays vegan cake stall, with not only gluten free cupcakes and biscuits, but DONUTS!! I have not had a donut for years and years and it is one of those things in the gluten free world that is very hard to crack (like croissants), as the gluten is what makes them light and fluffy, so I was very excited. Ruby Tuesdays’s do nuts and a (slightly squashed cupcake – from carrying all day). Ruby Tuesdays’s stall selection! They are also all vegan. Ruby Tuesdays’s stall is only there on the weekend, so you will be disappointed if you go there during the week! Unfortunately Maison Crêpes has closed down, so the crossed out text below can be ignored. 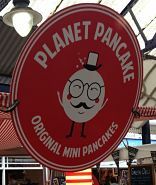 However, with every cloud there is a silver lining, as I have recently read about people visiting the Mini Dutch Dippers stall, now renamed as Planet Pancake. Although these are gluten free, they are not advertised as such as it was putting the non-gluten free people off! NB Not all the toppings are gluten free. I think these are actually poffertjes renamed for the English. I first tried them in Amsterdam about 20 years ago and made myself sick on them for eating too many (because they were so yummy, pre GF days!). This is an excellent addition to the market, particularly now Maison Crêpes has closed. Their opening days on the Greenwich Market website are down as Tue/Wed/Thurs/Sat, but still under the Mini Dutch Dippers name. I was thrilled beyond measure to find my favourite ever food – crêpes!! 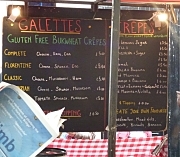 Maison Crépes were advertising gluten free galettes. The galettes (buckwheat flour) are usually reserved for savoury toppings, but the friendly staff were more than happy to give me what should rightly go in a crêpe – banana and nutella :-). The slighly nutty taste of the buckwheat is no problem at all for me and does make for a lovely savoury crêpe also. They had a separate crêpe stoves for the galettes and the wheat flour sweet crêpe which is great as it means less chance for cross contamination problems. If anyone knows if Maison Crêpes has gone to another market, please let me know! 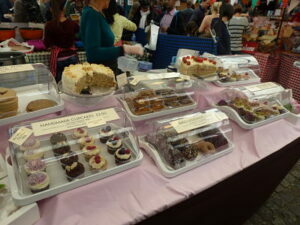 If you like markets, I have also done a post on Borough Market, near London Bridge, which is worth a visit.